1. Organisations have to make sure they are not unconsciously losing money from the unnecessary hardware upgrade. 2. Review whether the existing IT assets of the enterprise are being maximised or not. 3. 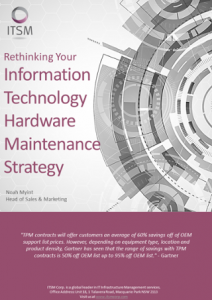 Explore cost-saving options for IT hardware maintenance such as working with a third-party hardware maintenance provider. Let us take a look at IT hardware maintenance contracts. When buying new IT equipment, a company also purchase maintenance agreement. If not, equipment manufacturer automatically packages maintenance contract to the sale. Sometimes, the company gets the hardware at a discounted price. They are happy with the few percentage they get from the hardware cost. However, what the company does not realise is that manufacturer can take the discount back through the maintenance contract, which refreshes every 3 to 5 years by default. Many organisations purchase maintenance contracts from OEM even though they find minimal value in what they are purchasing. Whilst most of them are aware of third-party maintenance contracts, only a few acted on it. Organisations would simply discard equipment and purchase replacements when OEMs no longer support them. Companies have to spend on new equipment thus, increasing unnecessary capital expenditure. Companies need not limit themselves with the end-of-life notices from their vendors. Some of the IT equipment could still have a longer useful life. Companies can work with third-party hardware maintenance service providers for support. On a positive note, OEM service agreements provide software updates and strong engineering resources. However, they offer very little or no flexibility and multi-vendor support. Hence, IT ends up managing several OEM contracts, which translate to augmented maintenance costs. Now, let us go back to Buffett’s rule on investing. For your organisation not to lose money due to unnecessary IT expenditure, forget status quo. You must agree to disagree sometimes. The only way you can tap cost-saving opportunities is when you open your options to resellers or third-party hardware maintenance providers. Learn what hardware maintenance and technical support your organisation can get from ITSM. Talk to one of our IT consultants now at +61 2 8355 1080 or click below to schedule a consultation.